With a $140 price point, the next generation Kobo ebook reader might struggle to compete with devices such as the Kindle, but its still got some reasonable upgrades since the last generation—such as a basic Wi-Fi feature. The device offers built-in Wi-Fi, access to Borders eBook store, and 100 preloaded classic novels. It is available for pre-order now. ANN ARBOR, Mich., Sept. 29, 2010 - Borders® today announced the addition of the new Kobo Wireless eReader to its digital assortment that now includes an industry leading selection of seven eReading devices. 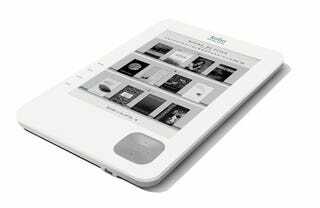 The addition of the new Kobo device advances Borders as a preferred destination for eReaders for virtually every household. Counting among its successes the recent launch of the Borders eBook store, powered by Kobo, and mobile applications - and its rapidly growing selection of eReading devices - Borders is poised for significant growth in the eReading market. Borders' new Kobo Wireless eReader comes with a built-in wireless connection, upgraded hardware in three new colors and a new processor that drives faster page turns. Just .4 inches thick and 7.8 grams, the lightweight eReader is available in three sleek color combinations: onyx, porcelain with a metallic silver back and porcelain with a pearlized lilac back. The new Kobo Wireless eReader allows consumers to browse more than 1.5 million books in the Borders eBook store and update their digital library wirelessly, directly from the eReader device, a smartphone or the Borders Desktop Application. With the intuitive control pad and a built-in-library management system, customers can easily navigate and organize their library by title, date last read and author. In addition, customers can add documents using an SD card, Adobe Digital Editions, or drag-and-drop. The eReader also supports EPUB and PDF documents, so customers can enjoy the option of borrowing and reading free eBooks from their local library. Designed by book lovers for book lovers, the new Kobo Wireless eReader reads like print on paper with its specialized E Ink® screen for a true book-like reading experience. With 16 grey scale levels to choose from, the device offers sharp graphics and crisp text that are easy on the eyes. The device also comes pre-loaded with 100 free classics so customers can immediately begin reading. Priced at $139.99, the device can be pre-ordered beginning today at www.borders.com/kobowifi and will be available for purchase in Borders stores by the end of October.